Staff members from Vanderbilt-Ingram Cancer Center (VICC) garnered an impressive second place finish in last month’s Downtown Derby Bed Race competition. 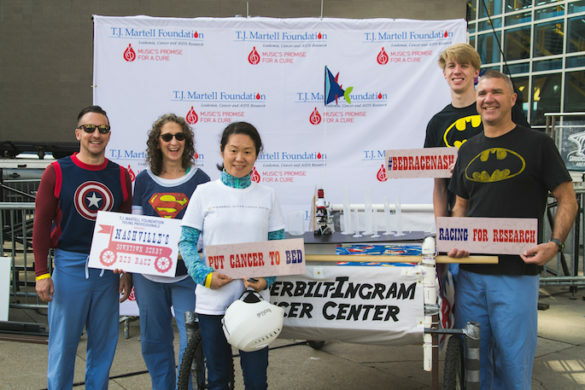 The annual event which raises funds for the T.J. Martell Foundation featured teams that built and decorated their own “beds” to race up 5th Avenue to Bridgestone Plaza in downtown Nashville. The VICC team, dubbed the “VICC Cancer Research Super Heroes,” designed a bed to reflect the “Bench to Bedside/Bedside to Bench” cancer research at VICC. The T.J. Martell Foundation’s Young Professionals Council raised more than $90,000 from this year’s race. The T.J. Martell Foundation is the music industry’s largest foundation funding innovative medical research for leukemia, cancer and AIDS. The Foundation supports early-stage research projects aimed at developing more effective clinical treatments which otherwise might not be funded. Vanderbilt University Medical Center’s cancer program was one of the earliest recipients of that financial support. Today the Foundation provides funding for a broad range of cancer research projects at VICC, including lung, breast, ovarian and prostate cancers, as well as hematological malignancies. My Cancer Genome, an online precision cancer medicine knowledge resource which provides up-to-date information about cancer mutations and related therapeutics, plus available clinical trials, also is supported by the Foundation.